The Tula Arms Plant was founded in 1712 by decree of Petr I who was, at the time, the Emperor of Russia. Petr I was concerned about the nomads invading the small village, and his concerns were justified considering the nearest arsenal was in Moscow, which meant the village was left defenseless. Building the plant worked: Tula began manufacturing ammunition, firearms, and even swords and knives to protect the locals and it wasn’t long before the plant began to grow. Today Tula supplies ammunition to marksmen all over the world and is well known for their economical prices. If you want to be a high-volume shooter but don’t want to drain your bank account, try Tula. 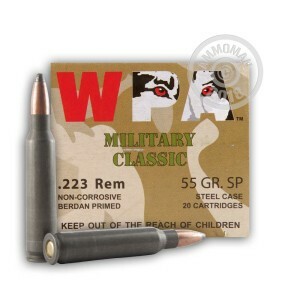 At 55 grain these are pretty lightweight rounds for the .223 Remington. Being lighter weight means these rounds fly down-range at higher speeds, and they’re still plenty heavy when it comes to their ability to make a significant impact. These are Soft Point rounds and deliver controlled expansion on impact, penetrating deeply for a catastrophic wound channel. Each round has a muzzle velocity of 3241 feet per second and muzzle energy of 1283 foot-pounds. 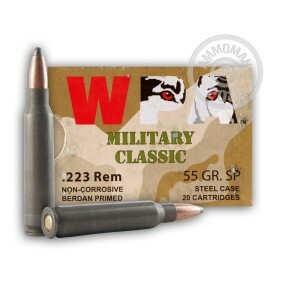 This ammunition is great for target practice and plinking and can also be used for hunting and varmint control. 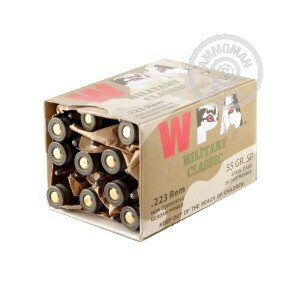 When you order this box of ammunition from Wolf you get 500 rounds. 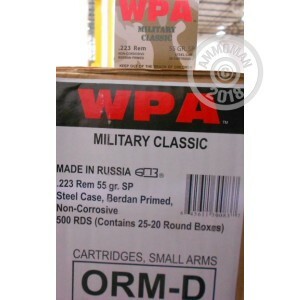 With that much ammunition you can keep your rifle well-fed and work on honing your marksmanship skills at some length. There are numerous drills and exercises you can do to improve your skills from firing prone to working on accuracy at various distances. Wolf is part of the centuries-old Tula Arms Plant. Tula has been manufacturing ammunition since 1712; yes, that’s 300 years of experience, and you can be sure Tula has fine-tuned their process along the way. Something else Tula understands is your desire to be a high-volume shooter, so they produce this ammunition in steel cases, using berdan primer to ensure ignition and extend its shelf-life. Place your order now and feed you rifle as much as it can eat.